by William Dyrness. Wm. B Eerdmans Publishing Co., 2009. Seminary professor William Dyrness promotes “worship renewal - and the related theological renewal” that accompanies it by asking “What kind of worship does God require of us?” and “What does faithful worship look like?” Dyrness addresses these questions by reviewing “historically significant developments” in worship during times such as the Middle Ages and the Protestant Reformation. Dyrness further explores the impact of history on current and future worship practices in both Protestant and Roman Catholic congregations. 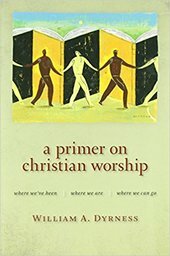 Additionally, Dyrness discusses the “Trinitarian basis of worship” and offers his view of worship as a basic tool for teaching theological ideas, such as “lament, reconciliation, and hospitality.” Dyrness points to the future of worship by offering a process for renewal that includes developing a thorough understanding of a congregation, as well as its cultural context. The included discussion questions make this an appropriate educational resource for Christian clergy, lay leaders, and worship teams.